My wife says there are three childhood milestones parents would pay somebody else to teach their kids: potty training, riding a bike, and tying shoes. There may be others, but these three are a good intro to the world of parental frustration. Multiplied by three kids, we tallied nine hurdles of child rearing. Our most recent cleared hurdle was Buster learning to ride a bike. For a while we thought we might get a two-fer on the bike riding. Alas, despite Big Man’s attempts to catch up to Buster, his parents weren’t equal to the challenge of teaching him to ride. When Buster was learning, it was difficult to get him to pedal continuously. He was tempted to put his feet down and keep himself from falling, the natural result of sitting on a dubious contraption with a propensity to tip over. He went too slowly and had trouble finding his equilibrium. He also kept looking backward to make sure the Parent on Duty hadn’t let go. He wasn’t fully vested in the idea that riding a tipsy two-wheeler would be worth the effort. One day, a switch flipped in Buster’s little noggin. 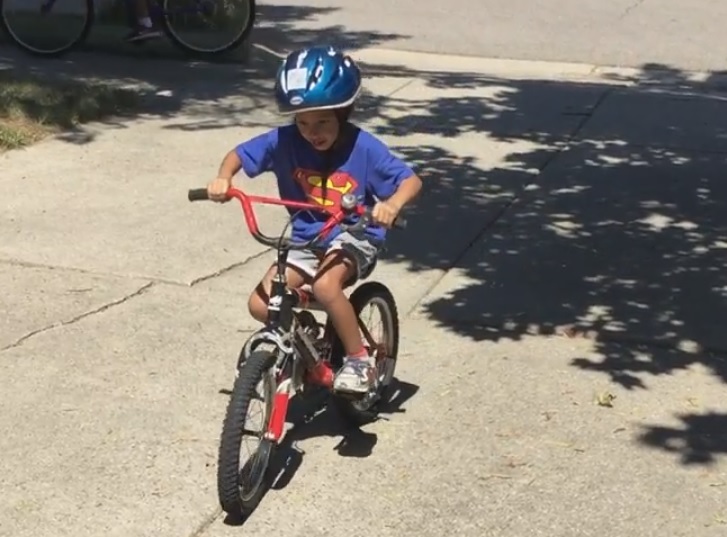 He decided he was going to ride his bike, and he wasn’t going to need any help doing it. He practiced on his own, refusing to let anyone hold him up. At the end the day, he could ride a bike. It got much easier when he stopped looking over his shoulder. Seeing this, Big Man demanded to have his training wheels removed. Being an obedient father, I complied. Recalling how Buster’s skinny legs rarely peddled faster than I could walk, I didn’t bother to change out of my plastic sandals as I prepared to walk alongside our newest learner. This was the undoing of the whole endeavor. Big Man has strong, pudgy legs. When they meet a pair of peddles they create a dynamo unlikely to be matched by middle-aged feet in plastic slip-ons. Also, his bike is low to the ground while my spine is old and composed of dried up chicken bones. It was an uncomfortable race to the end of the block for me. By the time Stooped-Over Daddy became Stooped-Over Daddy Sucking Air, we’d determined that Big Man was an expert peddler. Balancing was a skill of secondary importance to him. Mommy came to relieve Daddy, but was quickly left just as ragged and dirty. Even Buster stepped in to take a turn as spotter for his wobbly little brother, but he went heavy on expert advice from his deep well of experience and light on willingness to have his thicker brother fall over on him. It was a good workout for the whole family, but in the end Big Man had to go back to his training wheels until his worn-out family can recruit their strength. Maybe we’ll work on tying shoes while we catch our breath. 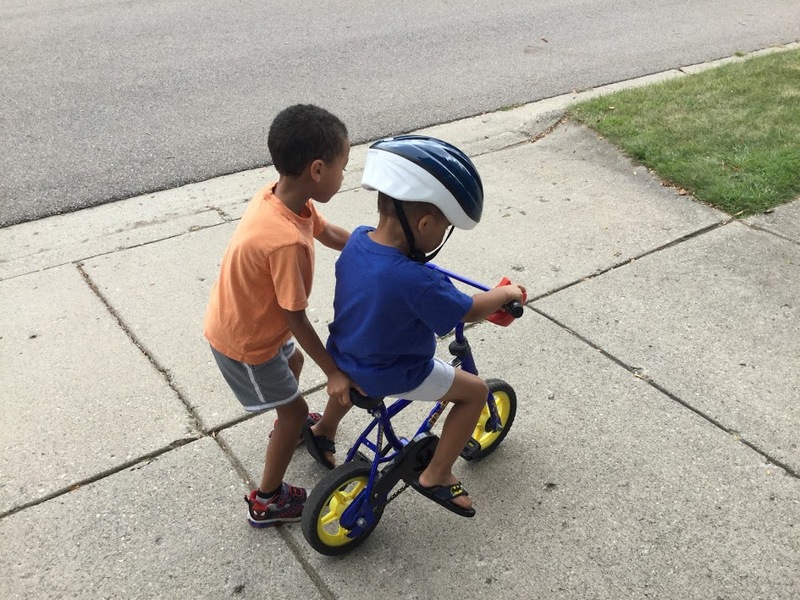 This entry was posted in Outings and (Mis)Adventures and tagged bicycles, boys, children, Dads, family, fatherhood, humor, kids, parenting, Sons. I have a 16 year old granddaughter who has ne’er tied a shoe in her life of flip flops, sandals and barefoot in the park. Forget those tedious lessons and go shopping for Velcro “laces”. They want to tie shoes. In fact, they want to tie mine for me. This explains why I fall down a lot. It’s possible kids were tougher back then. But if kids today aren’t as tough, it’s not their fault. They are what our society makes them into. For better or worse, it’s a different world. It’s okay, Amy. I sometimes wonder the same things about kids today vs my own childhood. But I have to remind myself that kids haven’t changed, the world around them has. Well since you’re bent over anyway, it wouldn’t be to far down to tie shoes.. Please tell me that the flip flops where not accompanied by white socks pulled up to your knees. Oh I just had a thought..Yes it was painful but it happens. How does one tie flip flops? I’m sure next time Big Man will have conquered the bike riding challenge without training wheels but you might want to wear combat boots. No white socks . . . that day. You’re right. Maybe that’s why he can’t tie shoes; his have no laces. Glad to help with this complicated life.. Thank goodness no white socks but, what did you mean by “that day?” Tell me it isn’t so on other days. Stuff happens when you’ve got to run outside and chase kids on the spur of the moment.